Don't know but I'm a bit despondent right now. Maybe it is the Fall Season. It is still Fall, right? Most people would have preferred to leave out the silhouettes. 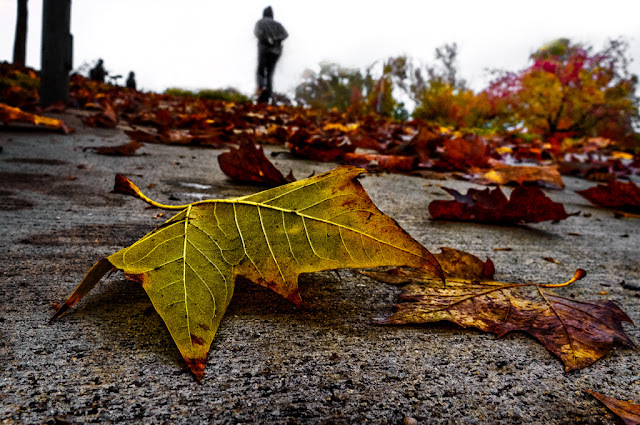 To me the guy walking away is as important as the leaf. In fact, I waited for that opportunity before I hit the shutter. In my view, there is a melancholic relationship with the guy, the other people and the leaf. The guy walking away from someone or something. The other people apathetic. The leaf symbolizing solitude. Without these elements, the image would just be another boring postcard imho. But not a lot of people see that. And I'm cool with that too. I agree about adding the human element. It's something that invokes personal interest by the viewer. I saw your photo more as the color of nature (bright with saturated hues) contrasting with the bland and non-descript people with their backs to the leaves (symbolizing indifference perhaps?). As far as despondency is concerned, I figure it just comes with the job.